it certainly has the ‘look’ of those bikes, albeit without the lights. 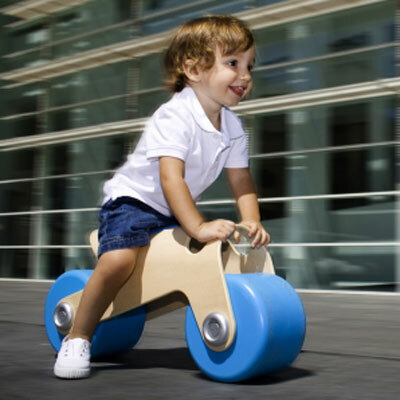 But this one isn’t designs for super speeds, it’s a first bike, described as an ‘ideal toddler walker bike’ to help children take their first steps in the world of two wheels. Colourful wheels are matched with ergonomic handlebars and a wood frame, all of which can be packed away into the free carrying bag. 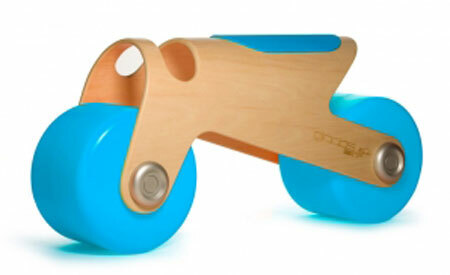 Great for developing balance and coordination, not a bad thing to be seen on either. Different coloured wheels are available (blue and orange), with both designs selling for £89.99. Credit to Things For Small People Pinterest board for the spot.